Luis Felipe “Pipo” Derani drove the Patron EMS Ligier to top spot on the time sheets during the final day of the Roar Before the Rolex 24 on Sunday. Derani drove the No. 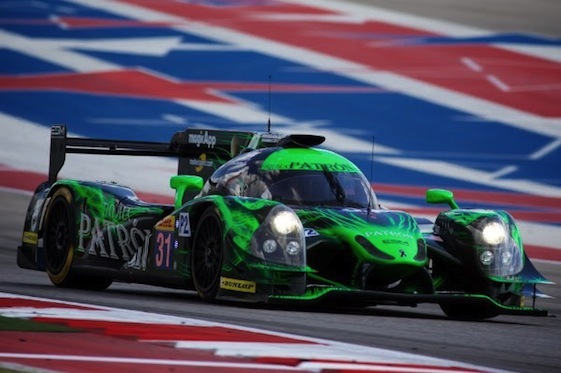 2 Tequila Patron ESM Ligier to a lap of 1:39.249 (129.130 mph) in the Roar, which is an open test held before the 24, the opening event on the 2016 IMSA WeatherTech SportsCar Championship schedule. Scott Sharp, Ed Brown and Johannes van Overbeek will co-drive with Derani, a 22-year-old Brazilian. Derani’s fast lap knocked the No. 60 Honda-powered Ligier JS P2 of Ozz Negri, John Pew and AJ Allmendinger from the top after the Michael Shank Racing with Curb/Agajanian trio led much of the three-day test. Oliver Gavin was quickest in GT Le Mans, turning a lap of 1:45.106 (121.934 mph) on Sunday morning, but it was Lucas Luhr that maintained the fastest time of the weekend with his 1:45.088 (121.955 mph) in the No. 100 BMW Team RLL BMW M6 GTLM during the Friday session. Leh Keen paced GT Daytona, 1:47.852 (118.830 mph) in the No. 22 Alex Job Racing WeatherTech Porsche 911 GT3 R, while Jack Hawksworth led Prototype Challenge (PC) with a lap of 1:42.118 (125.502 mph) in the final session aboard the No. 8 Starworks Motorsport ORECA FLM09. In Continental Tire SportsCar Challenge practice, Danny Burkett ran the fastest lap of the weekend with a lap of 1:57.430 (109.137 mph) in the No. 33 CJ Wilson Racing Porsche Cayman GT4 Clubsport. Burkett and regular co-driver Marc Miller were joined by car owner C.J. Wilson in both Grand Sport (GS) sessions on Sunday. Eric Foss was fastest in Street Tuner (ST), running 2:05.688 in the No. 56 Murillo Racing Porsche Cayman. SMP Racing is partnering with AF Corse in the American debut of the No. 37 BR01, a Paolo Catone-designed LM P2 Prototype that debuted in 2015 and finished sixth in its second race, the 24 Hours of Le Mans. Nicolas Minassian and Maurizio Mediani, the 2014 FIA World Endurance Championship (WEC) P2 titlists, will co-drive with Russians Mikhail Aleshin and Kirill Ladygin. Chip Ganassi always has had a knack for delivering surprises. Ganassi did it again with the driver lineup for the No. 01 Ford EcoBoost Riley DP Ganassi, which includes Austria’s Alex Wurz, who announced his retirement last year. Wurz, who competed in Formula 1 between 1997 and 2007, most recently drove Toyota’s P1 in WEC competition prior to his retirement. How did he end up in another ride so soon? Apparently there was a plan all along. Racing in America seems to be living up to Wurz’s expectations, as he has been impressed during his short time at Daytona International Speedway. BMW Team RLL brought a pair of brand-new BMW M6 GTLMs to the Roar, and have been at or near the top of the GTLM speed charts throughout the three-day event. “This is a work in progress, but we’ve been getting better every day,” said Bill Auberlen, who shares the No. 25 IHG Rewards Club BMW M6 GTLM with Dirk Werner, Augusto Farfus and Bruno Spengler. Fresh off of a Grand Sport (GS) championship in the Continental Tire SportsCar Challenge, Stevenson Motorsports’ Andrew Davis is looking forward to the 2016 season. At the Roar Before the Rolex 24, Davis joined Stevenson Motorsports teammates Robin Liddell, Matt Bell and Lawson Aschenbach in the No. 6 Audi R8 LMS GT3, which is brand new to the team. The team was successful, landing their R8 third-fastest in GT Daytona at the end of the weekend with a 1:47.949. One year ago, PR1/Mathiasen Motorsports scored a dramatic PC victory in the Rolex 24, taking the lead in the closing minutes of the race. The team followed up with class victories in the Mobil 1 Twelve Hours of Sebring Fueled by Fresh From Florida and Petit Le Mans powered by Mazda – in addition to the sprint race at Lime Rock Park – capturing the Tequila Patrón North American Endurance Cup. Tom Kimber-Smith returns to the No. 52 Precision Security Consultants/Prisma/Vista Del Mar ORECA FLM09 with the same goal with a new set of co-drivers, Robert Alon, Jose Gutierrez and Nicholas Boulle. It’s great to be back with the same team with new co-drivers,” Kimber-Smith said. “My three teammates are all rookies, but throughout the three-day test they haven’t done anything wrong and we seem to be fairly quick. This is similar to the same boat we had with the three drivers we were with last year. Muehlner Motorsports America – based just a few miles away from Daytona International Speedway in DeLand, Florida – made its Continental Tire SportsCar Challenge debut at the Roar and posted consistent, top-three times with the No. 21 Porsche Cayman GT4 Clubsport. Kyle Marcelli drove the car at the Roar, running fourth-fastest with a best lap of 1:57.966 (108.641 mph). “We have three of the new Clubsports,” team owner Bernhard Muehlner said. “One is at our shop in DeLand, and the other two are in Europe [at the team’s global base in Belgium]. We can have one or both of them shipped over here very quickly if needed. Another driver testing with a new team was Trent Hindman, the 2014 GS champion, who took laps in the No. 34 Alara Motorsports Mazda MX-5 along with regular driver Christian Szymczak. Rolex 24 weekend practice begins on Wednesday, Jan. 27, with sessions for the Continental Tire Challenge and Ferrari Challenge. Opening WeatherTech Championship practice and qualifying is on Thursday, Jan. 28. The BMW Performance 200 takes the green flag on Friday, Jan. 29, while the 54th Rolex 24 At Daytona rolls off on Saturday, Jan. 30.